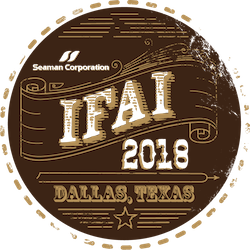 Seaman Corporation is Dallas Bound Next Week for IFAI! The Industrial Fabrics Association International (IFAI) Expo will be held next week in Dallas, Oct. 15-18. Seaman Corporation will once again exhibit at booth #1822. This expo represents many different markets, many of which Seaman Corporation fabric can be found in: Specialty Fabrics, Shade and TheWeather Protection, Military, Marine, Geosynthetics and Fabric Structures. The expo kicks off Monday with pre-expo conference breakout sessions during the day and the Industrial Fabrics Foundation Night in the evening. Tuesday, Oct. 16, the tradeshow floor is open from 10 a.m. – 5 p.m. Seaman Corporation will be hosting a reception in the booth from 2 – 3 p.m. Please plan to join us! The tradeshow floor is open again Wednesday from 9 a.m.-5 p.m., followed by a half day Thursday from 9 a.m.-1 p.m. A full schedule of events is available on the IFAI Expo website. To register for the most-anticipated event in the textile industry, visit the registration link of the IFAI website.